The nation's pollinators are in need of food and housing. Michelle Wisdom is stepping up. Wisdom, a graduate student in horticulture, is researching ways to incorporate bulbs and other flowers into lawns and other turfgrass areas as a means of providing much needed habitat for pollinating insects. Bees may be the most widely recognized pollinators of flowering plants, and they are the main pollen spreaders for fruits and vegetables, according to information from the USDA Natural Resource Conservation Service. But many animals help spread pollen about. 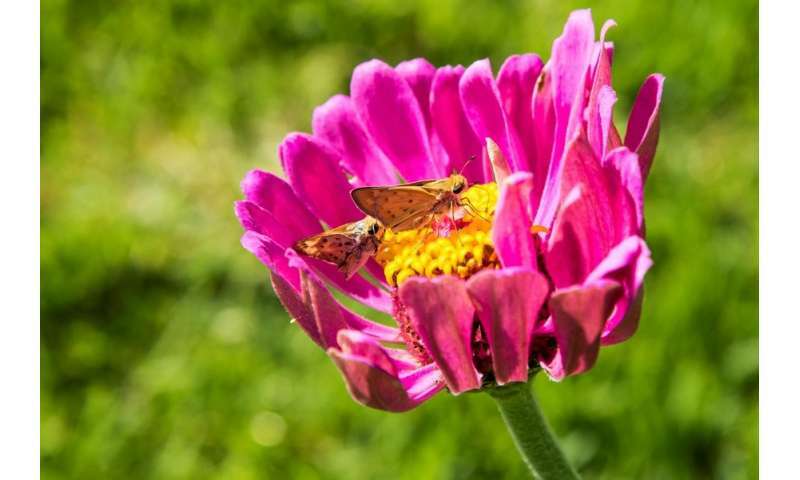 Other insects like butterflies, moths and beetles contribute to pollination. So do birds and bats. Pollinators are in trouble, according the NRCS and other sources. They face challenges from environmental contaminants, disease and parasites. But the most pressing challenge is loss of habitat. Wisdom said urban spread is the biggest contributer to habitat loss. According to USDA sources, more than 50 million acres of manicured lawns, golf courses, roadsides and other managed turfgrass surfaces make grass the largest agricultural crop in the U.S. Add Monoculture farmlands and the result is that pollinator habitats have become fragmented. When Wisdom was looking for a master's thesis research project in horticulture, turfgrass professor Mike Richardson suggested she work on the use of bulb flowers in warm-season turfgrasses. Richardson had done some research on using bulbs to add color to dormant, warm-season grass lawns in early spring, before the grass begins greening up. He had identified a couple bulbs that could persist in lawns planted with aggressive bermudagrass varieties. He thought Wisdom might be able to continue and expand that early work. Wisdom, a hobbyist beekeeper, wanted to expand that research to study the potential of flowers to add pollinator habitat to warm-season grass lawns. She began by looking at more efficient methods for planting large numbers of bulbs. If you're doing a few, just dig a hole put one in. If you're planting several dozen, that's a lot of work. She found that opening a trench with a sod cutter, tossing them in and covering them up works well. "After two years, you can't tell the difference," she said. Wisdom observed them to see if bees or other pollinators would use them early in the spring. She was delighted to see bees feeding on the flowers as early as February. "Bees will come out of the hive on mild winter days to relieve themselves," she said. "And while they're out, they'll feed if blooms are available." Wisdom also wanted to see if she could find flowering plants that could coexist with bermudagrass or buffalograss during the insects' active season. She said her goal was to create a succession of blooms from early spring through late fall. "A succession of blooms is best for pollinators," she said. "Most require diverse pollen sources for good health. And they also need a season-long succession of food sources." The trick with the later flowers was finding plants that not only could coexist with the grasses, but also survive repeated mowings. She was able to find a combination of bulbs, white clovers and a couple other flowering plants that provided a succession of blooms. In addition to contributing to pollinator habitat, the white clovers are legumes that make their own nitrogen and leave enough of it in the soil to help fertilize the grass. The combination provided a succession of blooms from as early as January through as late as November. So far, the plants have persisted for two years in her test plots. Wisdom concedes that those who want a nice, green, manicured lawn will probably not want clover and other plants popping up through the grass.But results of her research will be useful to homeowners who don't mind allowing other plants in their lawns in order to lend a hand to pollinating insects. Wisdom said another area that would be ideal for adding pollinator habitat would be grassy roadsides. The need, there, would be to use low-height plants that won't block drivers' visibility on the roadways. Do lime trees kill bees?